“I started painting during the hunger strikes”. We are sitting at the bar at Kelley’s Cellars, the oldest pub in Belfast. We have struck up a conversation with an older woman with pink hair that is curled into a big roll on top of her head, with false eyelashes and a pink paisley dress. The conversation has been a challenge – I can understand about every third word she says beyond the F bomb and “Jesus Christ” that is dropped liberally into every sentence. She’s been sitting at the bar drinking for a while. But it’s her husband who has us still sitting there and engaged. Turns out we have just met one of the famous mural painters of Belfast. Earlier in the day we rolled into town and immediately hired a cab to take us around to see the murals that dot the Protestant and Catholic neighborhoods. These murals are essentially enormous tags that cover the end of buildings in bright colors and political messages. They started to appear in the seventies, and both sides still commemorate their struggles and heroes and victims and political goals on the blank canvass of their neighborhoods. The Troubles, as they are known here, started in the 1920s when Britain freed all of Ireland except for six counties in Northern Ireland where there was a majority Protestant population, an affinity for the English, and (probably) most importantly, a thriving industrial base in Belfast that fed the British war economy. The Troubles – with attacks and bombings – built up in the decades after with peak violence in the 70s and 80s that finally subsided in a ceasefire negotiated in 1994. The IRA would bomb. The British sent in the army. 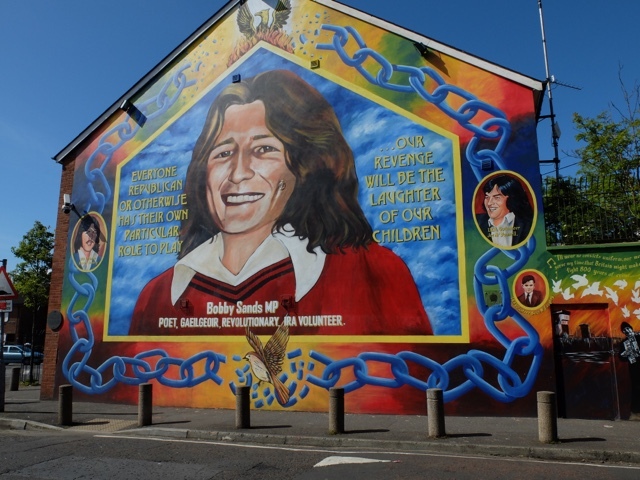 The hunger strikes in 1981 – where Bobby Sands and nine other young men starved themselves to death while imprisoned and became martyrs – captured the world’s attention to the violence in Northern Ireland – and was a catalyst that motivated many to take up the struggle to remove Britain from Ireland. In those days the city was armed, partitioned by high walls and guards and surveillance … violent and tense. Entire generations grew up surrounded by the destruction and lived through what we would now call terrorism in their daily lives. The murals grew out of the conflict. The first were likely an artistic expression of anger and grief and fear and loss. Later they became a powerful propaganda tool that each neighborhood used – Protestant and Catholic – to declare its loyalties and keep outsiders warned off their turf … and push the sentiments that drove both sides to increased conflict. 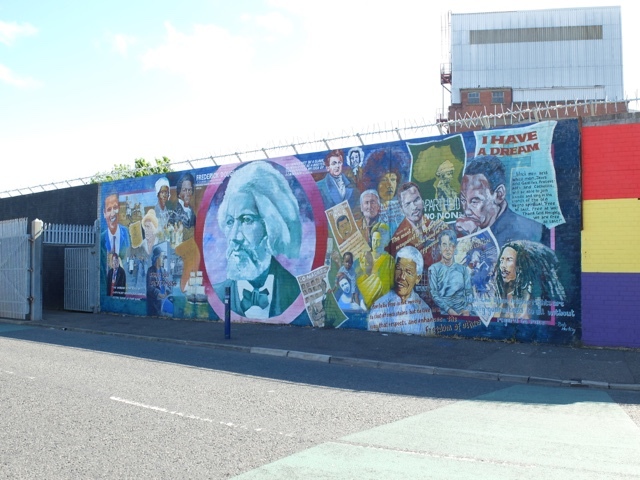 Marty Lyons is one of Belfast’s most celebrated and prolific muralists. His commissions are from Sinn Fein, and he still paints today. The paintings are different – and many focus more on global conflicts and injustices, while still reminding of the martyrs in the N. Ireland conflict. They remind people that this conflict is not resolved, even though it is no longer violent. He tells us that while he never felt in danger from doing his paintings, the British army would regularly throw paint over the work and he would spend a lot of time fixing the damage, or simply repainting the murals with a new image. He started painting during the hunger strikes, when he was moved by the men starving themselves to death in prison for their cause. 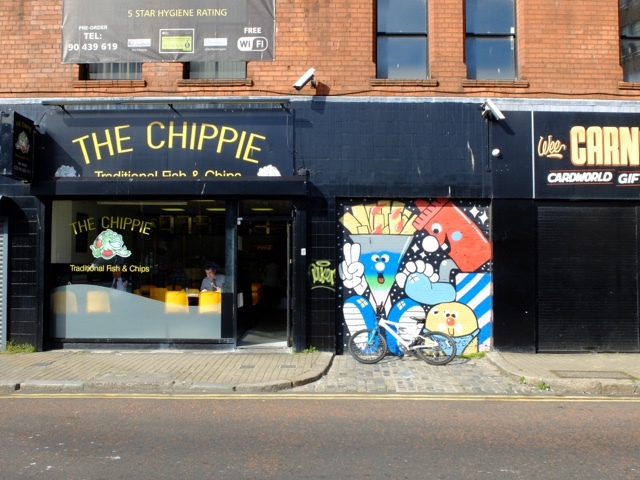 Most of the original murals from the Troubles on both sides are gone, with new murals painted in their place. They were destroyed by re-development or simply painted over or replaced. The conflict created a bi-product of an incredible political and art history. And while most of the older images are gone, they have inspired new murals – political and more benign artistic murals – that can be found on buildings all around the city. 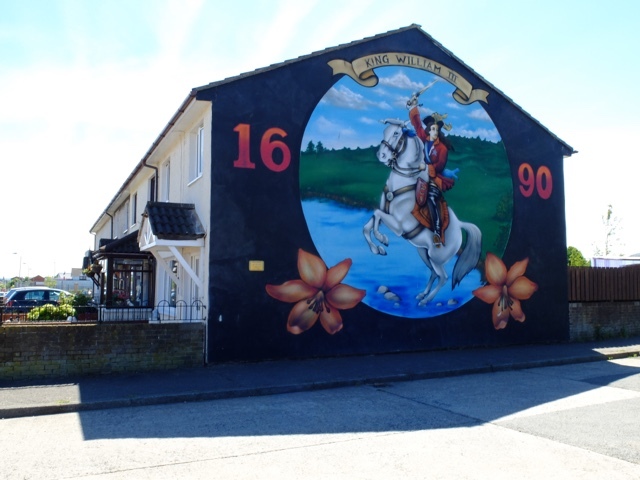 Protestant Mural commemorating the victory of Protestant King William over the Catholic king. To me, as a history and as art, these murals seem surprisingly unvalued. 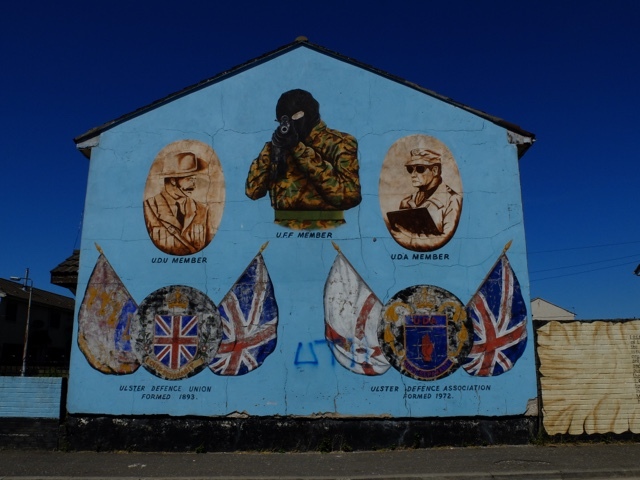 Almost as if the people in Northern Ireland haven’t fully been able to see their own troubled past with the perspective that allows these murals to have social value outside the context of the conflict that is still so fresh. Marty’s wife can’t understand why we – or anyone from outside Ireland – cares. Why would we come to see this? Why would we snap photos? What is so great about these murals? I try to explain to that to me, these are special. They are not just political. They are way to take art and translate emotion and history and drive actions … and you just don’t see this most places in the world where art is funded by those more concerned about not offending. But she’s having none of that explanation. And insists the murals are nothing special. And I think it must be hard to see the perspective of an outsider, when your entire life has been immersed in the violence and fear and politics and everything those murals represent. But despite this gap, we leave with hugs and air kisses and shared beer, and we talk about her children and how proud she is of her daughter going to college. It was an exhausting, though fascinating, interaction. Everyone we spoke with emphatically agrees that life here is much better now than it was during the violence. But what is clear is that while there is a currently a ceasefire and a peace, there is still tension and an effort to keep the Troubles unburied and very visible. To remind people there is not a solution yet, even though the violence has ended. People still step a bit closer and lower their voices when they talk about the divisions. And the high concrete Peace Walls that were build to physically divide the city still stand lining the edges of neighborhoods to separate the city. And the massive metal gates that allow cars and people to pass between one neighborhood to another are still shut every night … literally preventing passage. And our Protestant cab driver tells us that while he can now drive to the Catholic side, he would never go over there to have a pint … it wouldn’t be OK or safe for him to do that. 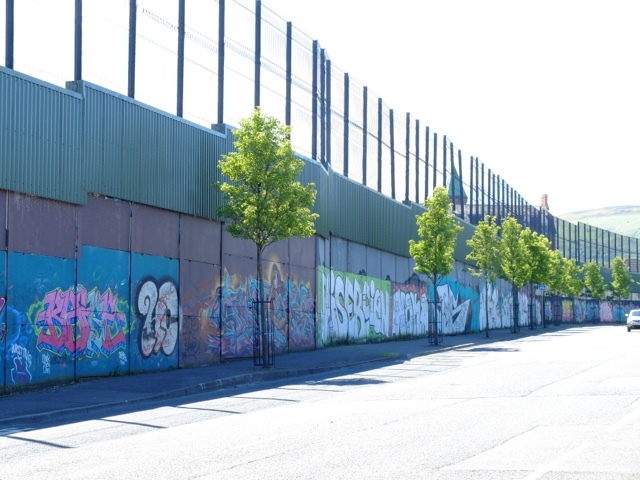 And I realized my error – in how I viewed the murals and how I viewed the thriving town of Belfast. I assumed the conflict is over just because the violence was over. But it’s clearly not over to many of the people who lived through it. And perhaps these murals, themost visible signs of the conflict will never become history or art until those who lived it are ready to let it.